There may only be two of us, but we are mighty! March 27th, 2019: We learned about how God created the world and all the animals and plants. We need to care for all creation because God made it. Chapters 7 & 8 were covered. March 13th, 2019: We learned that Jesus is a good Shepherd and we are his sheep. He cares about every single one of us and makes sure we don't get lost. Chapters 5 & 6 were covered. February 27th, 2019: This week we learned about how God made everybody different & how each of us are special. Chapters 3 & 4 we covered. 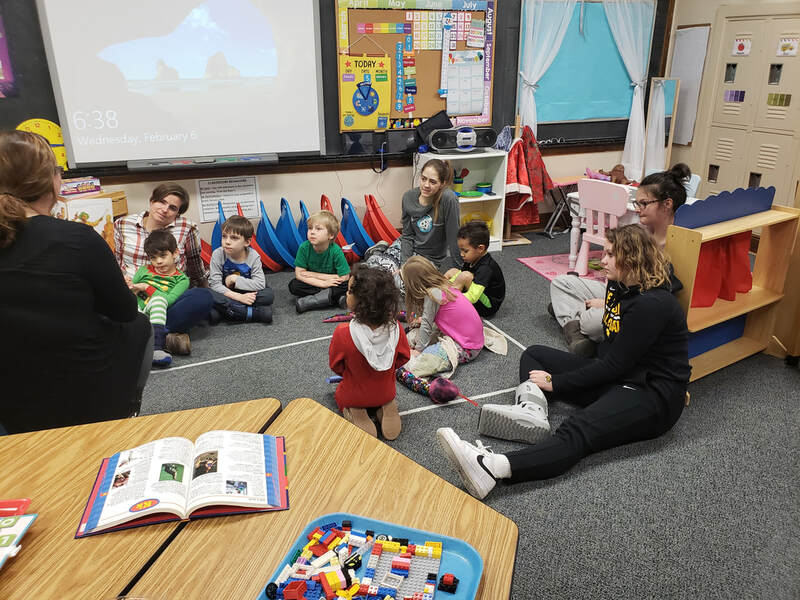 February 6th, 2019: We a special pajama night with kindergarten. We had some guests come read to us & we did lots of fun crafts! January 23rd, 2019: We started our new book this week! Covered chapters 1 & 2. We worked on a poster about friends (see below). We learned that Jesus is our friend and he is always there for us. We share and care for our friends like Jesus would. January 16th, 2019: Preschool will be using a new textbook/curriculum for the remainder of the year. The new series is called “Stories of God’s Love.” Each week the children will hear, talk about, have an activity around a particular Bible story. After a short classroom play break they will move into the 2nd lesson that will explore how we can live out that Bible story in our small family and friend circle. There will be a flyer to take home each week for you to see at home. December 12th, 2018: This week we combined with kindergarten again to watch The Little Drummer Boy. We got the chance to learn about who followed the star to Jesus in the manger. December 5th, 2018: We combined with kindergarten to learn about Advent and the Nativity scene. The kids learned about who belongs in the Nativity scene and why it exists. 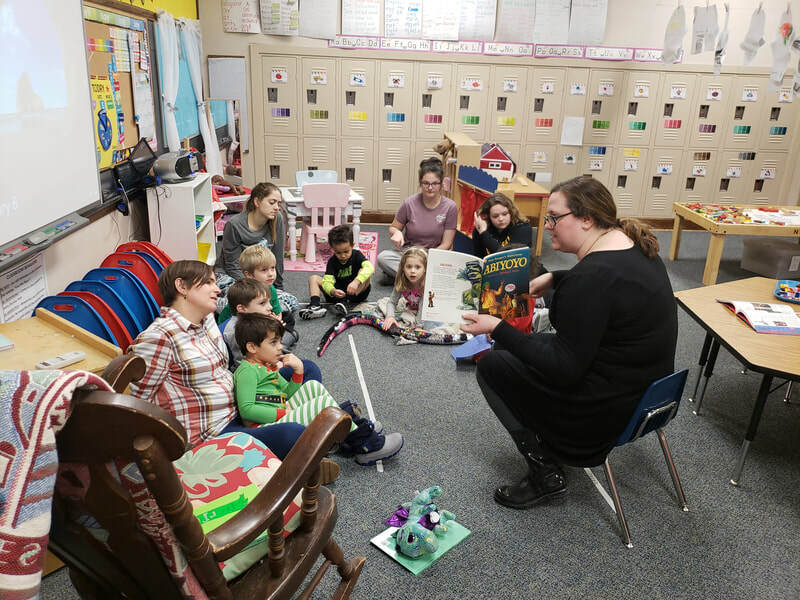 November 28th, 2018: Preschool read some books about Christmas and started talking about Advent. The chapters on Advent/Christmas were covered. November 14th, 2018: We talked about how there are three different parts of God, but they make one person. We solved a puzzle with three pieces to find one whole piece. Chapter 6 & 7 were covered. November 7th, 2018: We learned different ways to thank God. We also named some of the good things he has done for us! Chapter 4 was covered. October 24th, 2018: This week we learned about different ways to pray and ways we talk to God. We also made a list of things that we are thankful for. Chapter 3 was covered. October 3rd, 2018: This week in preschool we talked about how God created the seasons, and how each season brings us new surprises and gifts. Solving their 3 piece puzzle, that will make one whole piece (a heart). What the preschool class is thankful for.